Space scientists, including researchers from UNH, have described the first detailed analyses of samples of captured interstellar neutral atoms – raw material for the formation of new stars, planets, and human beings. Investigators on NASA’s Interstellar Boundary Explorer (IBEX) mission, including UNH space physicist Eberhard Möbius, David McComas of the Southwest Research Institute (SwRI), and Priscilla Frisch of the University of Chicago, as well as astronomer Seth Redfield of Wesleyan University, presented the mission findings at a press conference from NASA headquarters in Washington,D.C. Jan. 30. and broadcast via NASA TV at www.nasa.gov/sunearth. The NASA press conference occurred in conjunction with the publication of six papers in the February issue of The Astrophysical Journal (ApJ) Supplement Series by IBEX team members, including Möbius and other UNH authors. In addition to sampling the raw “star stuff” out of which stars, planets, and humans are formed, the findings are important because the interstellar gas surrounding us can affect the strength of the sun’s heliosphere – the protective bubble that shields our solar system from dangerous cosmic radiation. IBEX discovered that the interstellar wind is approximately 7,000 miles per hour slower than previously thought. This indicates that our solar system is still in what’s referred to as the “local interstellar cloud.” However, astronomers note, we will transition into a different region at any time within a few thousand years (very short on astronomical time scales) where conditions will change and affect the heliosphere’s protective capability for better or worse. As our solar system travels around the Milky Way through the vast sweep of cosmic time, the ever-changing nature of the heliosphere has likely had implications on the evolution of life on Earth as varying levels of radiation spurred genetic mutations and, perhaps, wholesale extinctions. A deeper understanding of our heliosphere will also aid scientists in exploring analogous structures, “astrospheres,” surrounding other stars throughout the galaxy, many of which also harbor planets according to recent findings. IBEX’s second major finding announced in the press conference and papers, that is, the first direct measurements of oxygen and neon from outside the solar system, shows that the composition of the local interstellar cloud appears to differ noticeably from the makeup of the sun and even the average Milky Way galaxy. There is less oxygen relative to neon in the local cloud than in the sun and the Milky Way as a whole, which presents a puzzle to astronomers. Perhaps, it means that a substantial portion of an essential ingredient of life (oxygen) is locked up in dust, or it could tell us how different the conditions in our immediate neighborhood are than at the birthplace of the sun. 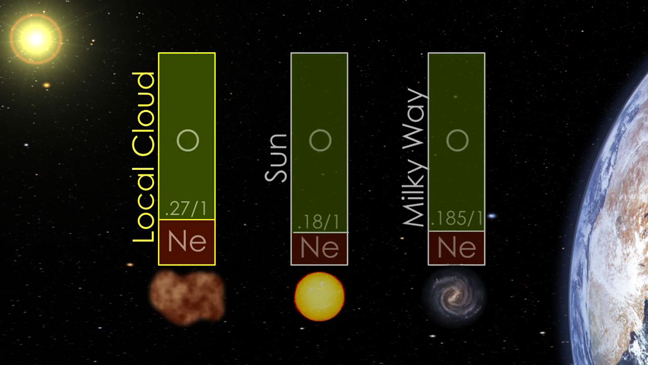 The neon-to-oxygen ratio in the neutral gas of the local cloud, as obtained with IBEX, in comparison with that ratio for the sun and the Milky Way galaxy. There appears to be much less oxygen in the gas of the local cloud, meaning either a substantial portion of the essential ingredient for life (oxygen) is locked up in interstellar dust or there were different conditions at the birthplace of the sun compared to our immediate neighborhood. IBEX, one of NASA’s Small Explorer missions, was launched October 19, 2008. 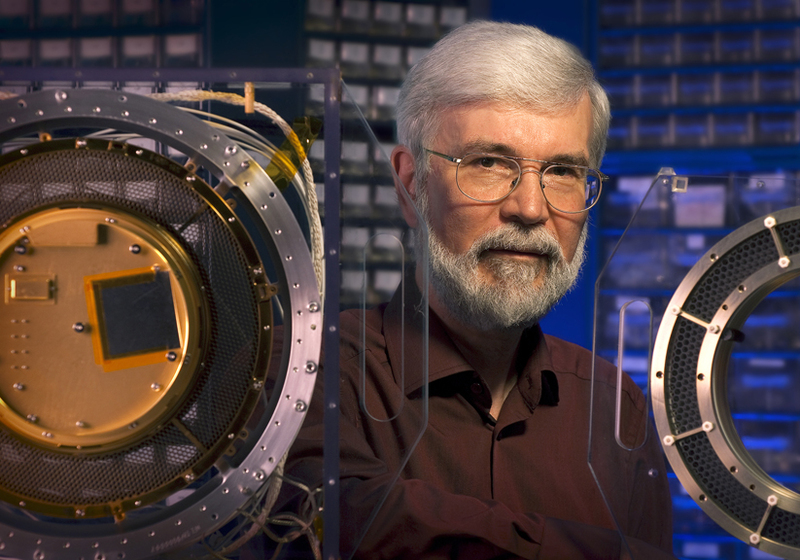 McComas of SwRI is the mission’s principal investigator. The space probe uses a pair of ultra-high sensitivity cameras – one led by the Los Alamos National Laboratory (LANL) and the other by the Lockheed Martin Advanced Technology Center (LMATC) – that contain important components designed and built at UNH. Möbius, currently on sabbatical as visiting professor at LANL, is the principal UNH scientist for IBEX, and the mission's Science Operations Center, directed by associate professor of physics Nathan Schwadron, is headquartered at UNH. In addition to Möbius and Schwadron, the other UNH authors on the ApJ papers include, David Heirtzler, Harald Kucharek, Martin Lee, visiting professor Peter Bochsler, graduate students Trevor Leonard and Xian Wu, as well as former physics undergraduates George Clark, Morgan O’Neill, and Lee Petersen. The scientific effort that led to the six papers was carried out by a large collaboration that includes scientists from six US research institutions as well as the University of Bern, Switzerland, and the Space Research Centre of the Polish Academy of Sciences. ApJ publishes significant papers that contain extensive data and/or calculations and are of particular interest to the scientific community. The Supplement contains many of the most frequently cited papers in the astronomical literature. Written by David Sims, Institute for the Study of Earth, Oceans, and Space. Photo of Eberhard Möbius by Perry Smith, UNH Photographic Services. Additional photo Courtesy NASA Goddard Space Flight Center. Watch a video explaining space plasma physics in under two minutes.